Can Your Veins Be Dangerous? 30 Million Americans Have This. Around 30 million people in the US have venous reflux disease. Of these 30 million, fewer than 5% seek treatment. If you suspect you have a venous disorder, you should seek treatment immediately. Venous reflux disease can lead to a life-threatening condition. In fact, venous disease, which generically refers to a number of conditions, results from the backward flow of blood (reflux) in a weakened vine. This backward flow causes the blood to pool in the veins of the lower leg. Chronic venous insufficiency (CVI) is more serious. In fact, this vein disease is two times more common than coronary heart disease. Statisticians estimate the direct cost of treating CVI is around $150M to $1B per year. In addition, most of the lower extremity ulcers (or 70% to 90%) are venous stasis ulcers, all of which emerge from vein disease. 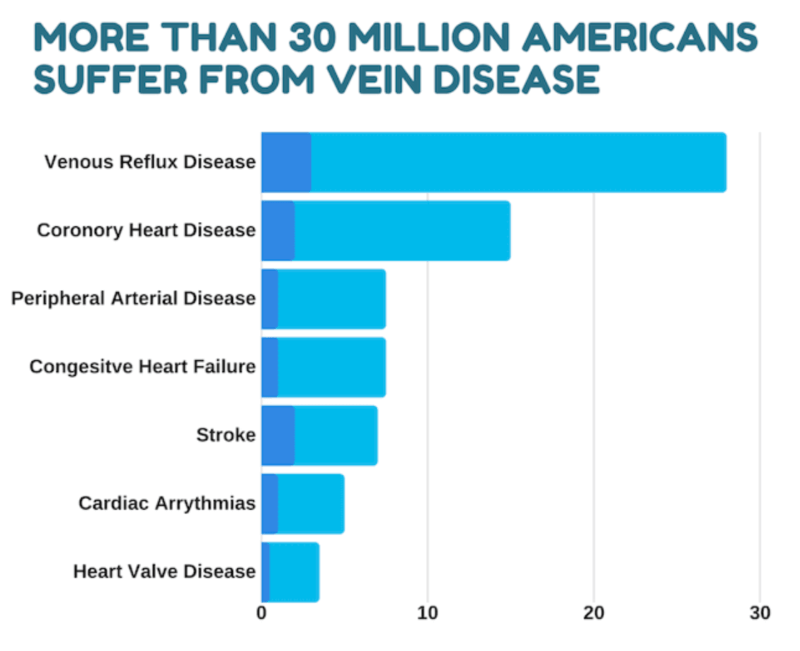 Venous reflux disease, which results from weakened valves and vein linings, affects more Americans than coronary heart disease (which affects about 15 million people) and peripheral arterial disease, (which affects about 6 million people). Six million people also are diagnosed with congestive heart failure annually – still less than those diagnosed with vein disease. To a lesser extent, diagnoses are made for stroke, cardiac arrhythmias, and heart valve disease. Lymphedema categorizes any swelling that results from an accumulation of lymph. This increase can result from added tissue fluid or from inefficiencies of the lymph vessels. Patients with lymphedema often feel pain and experience problems with immobility. Blood clots in the leg veins are often called phlebitis or thrombophlebitis. Blood clots in the legs can range from minor annoyances to serious, life-threatening conditions. Varicose veins represent dilated and twisted veins within weakened vein walls and valves that have stopped functioning correctly. They usually surface in the lower extremities and support eh health of the skin and superficial tissues. The veins appear as bulges when a person stands and disappear from view when the limb is raised above the heart. Venous leg ulcers, or venous stasis ulcers, occur from diseased veins in the leg. An ulcer occurs in one in every 50 adults and can impact a person’s ability to work or perform the daily tasks of living. Unfortunately, venous disease is a real and treatable condition. However, most general medical practitioners do not know enough about the condition. While they may prescribe medicines, compression stockings, or anti-depressants to alleviate pain or swelling, the situation usually needs more of a direct line of treatment. If venous reflux disease progresses, it can trigger the formation of spider veins, varicose veins, lymphedema, blood clots, and venous stasis ulcers. You can see how this disease progresses by reviewing the stages below. Spider veins represent small thin blood vessels that appear near the skin’s surface. The blue and red dilated veins and capillary veins are also called telangiectases. They appear more in women than men. Varicose veins typically appear near the skin’s surface as blue or purple ropey looking veins. According to statistics, these veins affect and interfere with the lives of 75% of the people diagnosed with this condition. The veins are accompanied by swelling, leg heaviness, tiredness, itching, numbness, and tingling. Some patients report restless sensations in the legs. It is important to treat this condition immediately, as prolonging it can lead to more pronounced vein problems or irreversible damage to the lymphatic system. When a vein disease progresses, the patient often experiences leg swelling. That is because a backflow (reflux) of the blood interferes with the ability of the body to reabsorb excess fluid. While elevating the legs can help, it will not cure the problem. Usually, when swelling is an issue, it is due to an underlying cause. Congestion in the veins may change the skin’s color to a whitish hue or a reddish brown. The skin, in turn, may also thin and take longer to heal. Once an ulcer develops, the doctor can facilitate treatment to promote wound healing and reduce the associated symptoms of heaviness or tiredness in the legs. Ulcers result from improper functioning of the veins’ valves. These kinds of ulcers can turn into chronic and painful wounds if left untreated. Both stages five and six are advanced forms of superficial vein disease. Without seeking treatment, a patient can experience a worsening of the condition. That is why treating vein disease in the early stages will prevent the escalation of future difficulties – some of which can be life-threatening.